In weaving, the taut lengthwise threads which are used to string the loom, are called the "warp." The crosswise threads, which are drawn over and under the warp, and with which the pattern is woven, are called the "weft." The little flat stick with which each row of the weft is "beaten" to make the work firm and even, is called the "beater." 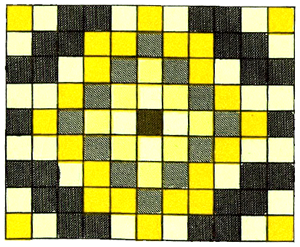 After you have decided what you are going to make from the woven squares, it is wise to plan the color scheme. If you are going to use 4" squares, plan the size of the article in multiples of four. In other words an afghan 36" x 44" will consist of nine squares in one direction and eleven squares in the other. Ninety-nine squares in all. On a piece of paper with a ruler and a pencil, draw the same number of squares that will be in the finished article. Plan the color scheme, and the design. Using the same color paints or crayons, as you will use yarn, fill in the squares on the paper pattern, as in the picture above. You will need 2 colors of paper. On one of the pieces of paper you will draw lines all a half inch apart on a piece of paper (from short end of paper to other side of short end of paper)...with a ruler so that they are perfectly straight. Then Fold the paper in half the short way so that you can cut the lines out more easily. Then you will draw lines from long side of paper to other side of long side of paper and draw lines a 1/2 apart. These will be the strips of paper that you will weave with. Then push one of the paper strips and push it into the cut the first cut line and up through the next cut lien and then down the next cut line and up through the next cut line, and so forth. Next strip of paper goes down (instead of up) thru the first cut line ... the opposite of the original piece of paper. This is weaving at its simplest. Push each weaved strip down as close as possible to the previously weaved strip of paper. Finish off the placemat with contact paper or laminate it. 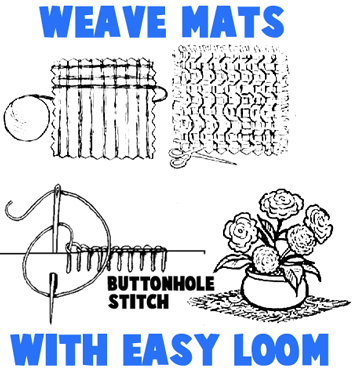 Gather the following items to make this weaved mat....One 6" square piece of sturdy cardboard, a pencil, scissors, Scotch tape, yarn, needle, string, and a ruler. Draw a line 1/4" inside cardboard square. Mark off every 1/2'" along inside frame and cut a V to each point (see the zig-zags on the first image above...this is the V shapes we speak of). Tape end of yarn to back of cardboard and start at lower left corner to wind yarn up and down around notches. Turn loom and wind yarn crosswise. Continue weaving until there is a 4-strand thickness. Thread needle with string and make buttonhole stitch up and down the rows. The 3rd sketch above shows you how to blanket stitch. Go to this page to find the instructions for blanket stitching. Secure thread. Clip mat from loom (from back) and trim starting yarn. How to Make and Weave a Woven Heart Basket for Valentines Day - If you want to make this beautiful paper or felt woven heart basket, then you are in luck. Below you will find the instructions. You can bring this into school to hold all of your classroom friends’ Valentine’s day cards or you can fill it with flowers or treats to give to somebody you love. Macaroni Button Looms - Find out how to make these Looms with macaroni noodles, buttons, and string. 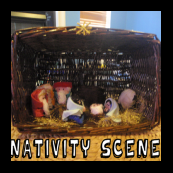 A Nativity Scene : Woven From Start to Finish - Learn how to make the baby Jesus, the 3 Wise Men, Joseph, Mary, as well as a few animals. Use a basket for the Stable. Make a Weaved Ivy Hanging Pots - Learn how to make a beautiful ivy pot out of weaved string, raffia, or wires. How to Weave Purses / Handbags for Mom’s Gift on Mothers Day - Here is a great Mother’s Day crafts project for kids to make for Mom or Grandma. Below, you can find out how to make a cardboard loom to weave beautiful handbags / purses to give as gifts or to keep for yourself. Either way, it is a lot of fun and the results are beautiful. This is a great crafts project for older kids and girls, as well as teens. Woven Paper Friendship Bracelets - Learn how to weave paper strips into these cool striped bracelets. These make beautiful friendshipo bracelets that can be tied together with ribbons. Make Your Own Cardboard Beading Looms - You can make advanced beaded jewely and art with a simple-to-make cardboard loom project. You will love this. Square Weaving Looms - Find out how to make a square wooden loom with nails...then learn how to weave on it. Weave Baby Jesus and His Cradle - Make a great Jesus and Cradle by weaving wiht a cardboard loom. Find out how. Weaving Coasters - Make these woven coasters with the following step by step instructions. Weaving Joseph and Mary - Learn how to weave using a simple cardboard loom...the final characters that are made look so amazing. Make These 3 Wise Men for Nativity Scene - Learn how to make these three wise men for the nativity scene. Make Your Own Yarn Leprechaun Beards - Use a cardboard loom to make your very own leprechaun beard.